The Fifty-fifth United States Congress was a meeting of the legislative branch of the United States federal government, composed of the United States Senate and the United States House of Representatives. It met in Washington, DC from March 4, 1897, to March 4, 1899, during the first two years of William McKinley's presidency. The apportionment of seats in the House of Representatives was based on the Eleventh Census of the United States in 1890. Both chambers had a Republican majority. There was one African-American member, George Henry White, a Republican from the state of North Carolina. March 4, 1897: William McKinley became President of the United States. February 15, 1898: Spanish–American War: USS Maine exploded in Havana harbor. December 10, 1898: Treaty of Paris ended Spanish–American War, 30 Stat. 1754. July 1, 1898: Bankruptcy Act of 1898 (Henderson-Nelson Act), ch. 541, 30 Stat. 544, gave companies an option of gaining protection from creditors. February 6, 1899: Treaty of Paris, ending the Spanish–American War. Guam, The Philippines, and Puerto Rico became possessions of the U.S. Senators were elected by the state legislatures every two years, with one-third beginning new six-year terms with each Congress. Preceding the names in the list below are Senate class numbers, which indicate the cycle of their election. 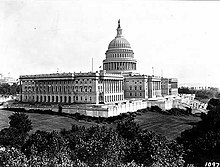 In this Congress, Class 1 meant their term ended with this Congress, requiring re-election in 1898; Class 2 meant their term began in the last Congress, requiring re-election in 1900; and Class 3 meant their term began in this Congress, requiring re-election in 1902. 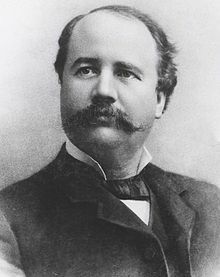 (1) John Sherman (R) Resigned March 4, 1897 to become U.S. Secretary of State. (3) Vacant Failure to elect. (3) Joseph H. Earle (D) Died May 20, 1897. (2) Isham G. Harris (D) Died July 8, 1897. (1) James Z. George (D) Died August 14, 1897. (2) Edward C. Walthall (D) Died April 21, 1898. (3) Justin S. Morrill (R) Died December 28, 1898. ^ a b "MALLORY ELECTED SENATOR". The New York Times. May 15, 1897. p. 12. Official Congressional Directory for the 55th Congress, Extraordinary Session. Official Congressional Directory for the 55th Congress, Extraordinary Session (Revision). Official Congressional Directory for the 55th Congress, 2nd Session. Official Congressional Directory for the 55th Congress, 2nd Session (Revision). Official Congressional Directory for the 55th Congress, 3rd Session. Official Congressional Directory for the 55th Congress, 3rd Session (Revision).